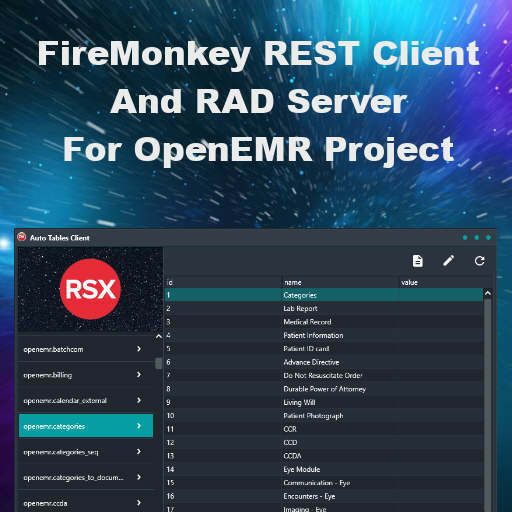 OpenEMR is a “leading open-source electronic medical record and practice management software.” Auto Tables for RAD Server was used to generate a FireMonkey CRUD REST client and RAD Server REST API for the OpenEMR database schema. Auto Tables for RAD Server is an open source project that will take any FireDAC supported database and automatically generate a RAD Server REST API for the database. Additionally, Auto Tables for RAD Server will now automatically generate a CRUD REST client in Delphi FireMonkey to connect the RAD Server REST API. The automatically generated OpenEMR FireMonkey client should run on Android, IOS, macOS, Windows, and Linux (using FMXLinux). This is a single source client and a single UI. It uses a number of Delphi features like Tasks, the Embarcadero dark style (Material Oxford Blue), the EMS components, LiveBindings and much more. Both Auto Tables for RAD Server and the OpenEMR CRUD REST API sample are free and open source. You will need to edit the FDConnection component in the RAD Server project to enter your MySQL username, password, and hostname. Additionally, your database should be named openemr. Otherwise you will need to re-generate the project with Auto Tables for RAD Server using your specific database name. You can find out more about the OpenEMR project and download the source code over on GitHub. OpenEMR is built in PHP and uses MySQL as the database. Head over and download the full source code for the OpenEMR CRUD REST API client and server for Delphi FireMonkey.